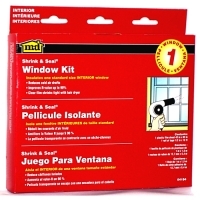 The Macklanburg-Duncan Shrink & Seal Window Kit is installed over the entire inside of the window to eliminate drafts, energy loss, and frost build up through this source. It increases the insulating R-Value of a window up to 90%. This window insulator comes with a clear, plastic sheet of film measuring 42” x 62” and a 1/2” x 18’ roll of tape. It can be easily installed in a matter of minutes, and the only tools required are a hair dryer and a pair of scissors.